Look closely at the above photo. Do you see anything interesting? It is interesting if you like nothing. We saw a lot if it. It was a long ride to no where. The scenery was all the same…vast wide open spaces with a few cattle here and there. Hard to believe you can ride one direction pretty hard for almost 7 hours,120 miles and not see any signs of civilization. We really are experiencing America up close and personal. It is a big place. It is an experience we are all savoring. Another severe clear day. Although it did rain last night on us during dinner and today there were storm clouds building on the horizon, we’ve still been “high and dry” on our rides ever since leaving the Portland area 15 days ago. 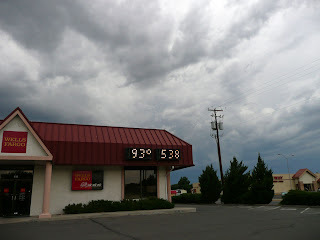 The temperature did get in the high 90’s today but it was a “dry heat” (about dried me out). The tri-motor is still in action. Will rode the first 2/3 solo and then joined his team at the last sag for the last stage ride home (almost all downhill). Waking up at 4:30 am and waiting for the crack of dawn to show its face so our ride leader will let us start a 120 mile ride into the wind is not the make up for a feel-good day. However, after 3 Advil’s and a little nap I felt surprising good. One of the biggest reasons I feel so good after such a challenging day was the train ride that our 40 year old Dutch wonder boy provided. 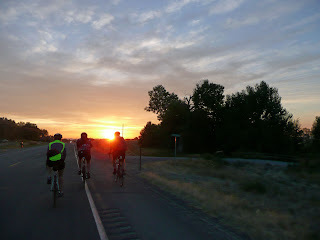 I rode with Rich for the first leg of the trip and he was riding well. 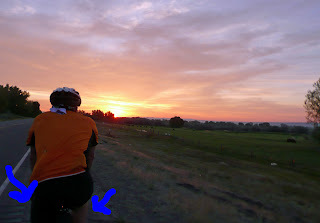 He caught up with his riding buddy Wildflower Sarah (see earlier blog) at the first sag stop. I scurried to join up with Gerard and he was riding with Daco and his entourage of Bud and Cindy. Daco proceeded to pull all of us for the entire second stage. At the third sag stop Allois caught up with us. Daco and Allois proceeded to pull the rest of us free loaders in the last 30 miles through a 10 knot headwind. The ride would have been a lot longer and a lot less fun without their help. Thanks a lot guys! 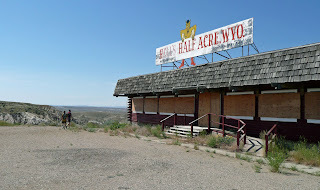 The one exception to signs of civilization was this not-so-thriving establishment. 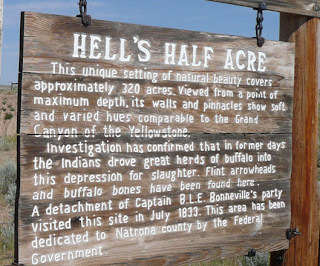 Bud and I at the edge of Hell's Half Acre. Double click for a better view. Cindy likes to bring replica's of her daughters with her on her long rides. This is her second cross country adventure. 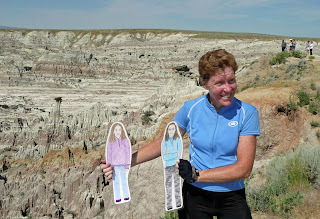 She told me that her daughters find her photo's a lot more interesting with these paper replicas of themselves in the pictures. A family tradition she's been doing for a while. Rich…. Let me tell you about Rich Simpson’s wonder ride. Rich was a non biker six months ago who wanted to go cross country. He bought a nice bike…easy enough. He went to spinning classes. We rode a couple of times together before this ride. During those rides I thought he could make it. He struggled, said I rode much much faster than he was capable of and didn’t do group rides and drafting well. He’s worked at it. Today I think he crossed some magical sort of line and became a real biker. The above photo of Rich, taken by be as we ride during the first 34 mile stage of our 120 mile adventure today. A couple things to note: 1) He is in front of me. 2) How steady he is. 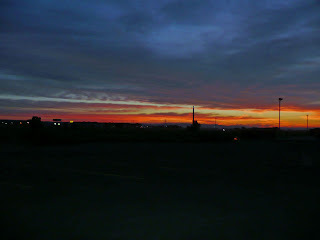 3) The beautiful sunrise. 4) The arrows. They are pointing out on the left a rumble strip that will break you and your bike nearly apart like a jack hammer if you happen to ride over it (I did three times today that I won't forget for a while... forgive me Mariah). The right arrow is the edge of the pavement. We rode for the vast majority of this ride on this narrow strip of pavement that was about 1.5 feet wide. Not a great ride for a beginner. Rich did it like a true vetran champion. On this 120 mile ride Rich came in shortly behind the group led by the Dutch all star biker and his German friend Allois. He did it with just he and Sarah. They came in substantially ahead of all of the other riders… 7th and 9th out of our 75 person cast. He was smiling, felt good and seemed energized by the experience. He’s now a good drafter, has learned how to pull nicely and is a stable, confident road biker. I am very proud of him and the progress he’s made. Congratulations Rich! 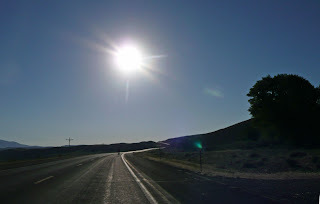 Check his blog to be sure, but I think he told me he averaged 16.5 mph into a healthy Wyoming headwind for 120+ miles. AND that’s after riding over 1200 miles during the last 17 days. Well done Rich and congratulations! Today we say goodbye to a few of the “stage” riders…those not doing the entire trip. Allois is now gone. Tracy and Mike from South Bend are gone as well. Mike had never been on any kind of long distance ride before. 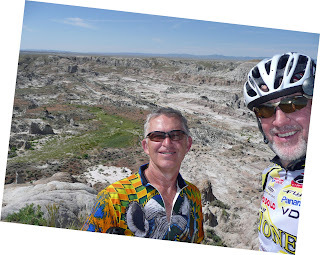 He went the last 7 days with his buddy Tracy who bet him $200 that he wouldn’t be able to do the entire ride. Tracy lost. Congratulations Mike! In the evening after dinner we had a round of Karaoke at the Casper Holidome bar. It was nice to be able to relax, not worry about having a glass of wine and having to get up early in the morning. I needed a night like this. Rich and Gerard walking to dinner. Real biker dudes. Whoops. This was the contemplation day! You sound like a great cheerleader for the group. Keep up the positive attitude. Hey Ralph, I hope you are having a fantastic time. Did you ride in TOSRV this year? I rode by myself down and back. I wish I could take 50 days off sometime and do that kind of ride. I saw Cindy at the DiCello's this past weekend. She said she wants to go dancing when you get back. Are you up for that?